Apple announced today an update to its iMac computers, improving performance through faster processors, WiFi, graphics and storage options. The 21.5 inch and 27 inch models of the iMac both will come equipped with Intel’s faster, Haswell fourth generation quad-core processors. They will also both support the 802.11ac WiFi standard (if you have an 802.11ac base station to connect to, of course) for data transfer speeds boasted as much as three times faster than the previous WiFi generation. Apple has also added in PCIe-based storage to both models to support faster Flash storage and Apple’s Fusion Drive configurations even quicker. Apple’s 27-inch iMacs have been having some issues lately, which have caused long delays in shipments, but now it looks like things are back on track. So if you’ve been waiting for your iMac to arrive, some users have started to receive notifications that the units will be shipping out soon. 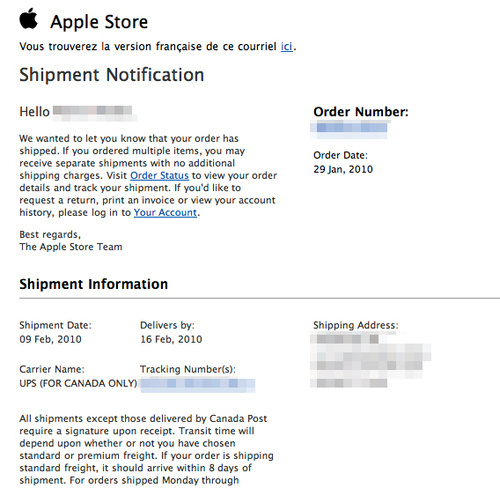 To give you some idea, one user who ordered a 27-inch iMac on January 29th has received his shipping email, letting him know that the unit is scheduled to leave on February 9th. Apple has pushed back the shipping time for all 27-inch iMacs to two weeks. The company already delayed them by five to seven days earlier. This delay is believed to have something to do with a quality measure involving cracked screens on delivery and also systems that experience periodic flickering or lose their video signal completely. 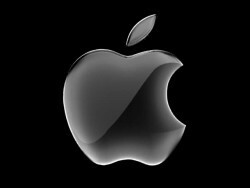 This is not good news for Apple since it will delay many orders past Christmas. This means that it will disappoint buyers and could also affect Apple’s quarterly results, which were given a boost by new iMac revisions. So don’t expect your new 27-inch iMac under the tree this year. After you’ve let Colorware have their way with all of your other gadgets, the outfit now wants to customize your latest Apple gear. For just $500, you can allow your iMac to wear a technicolor dream coat, or you can pay $700 premium (over Apple’s prices) to buy one from ColorWare. They’re also painting the Magic Mouse, so it won’t feel left out. It’ll cost you $100, or $30 bucks to send your own in. Why not spice things up with some new colors? Not that it’s a surprise, Apple has unveiled some new iMacs. The new models feature 21.5-inch and 27-inch 16:9 displays along with all-aluminum enclosures. The new widescreen IPS panels are LED-backlit and provide 178-degree viewing angles. 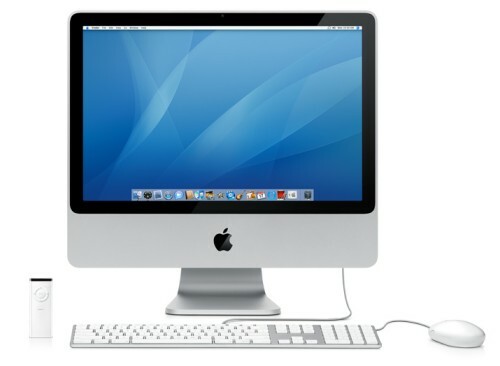 The 21.5-inch iMac sports a 1,920 x 1,080 resolution, while the 27-inch version leaves that in the dust with 2,560 x 1,440. Ports are the same as the previous model, but they’ve added an SD card slot and video-in on the 27-incher. The wireless keyboard is now standard along with the new Magic Mouse. The Holiday season is upon us, so it makes sense that Apple would be ready to offer its 2009 Mac product line. According to Apple Insider, it could happen as early as this month. We’re talking a new line of iMacs with more stylish enclosures and some other added features not previously available. Apparently, the new all-in-one, dual-core desktops were finalized earlier in September and have been rolling off the product lines for about two weeks. A thinner chassis and lower prices are expected. We may even see Blu-Ray. Add this one to the ever growing pantheon of Apple rumors. 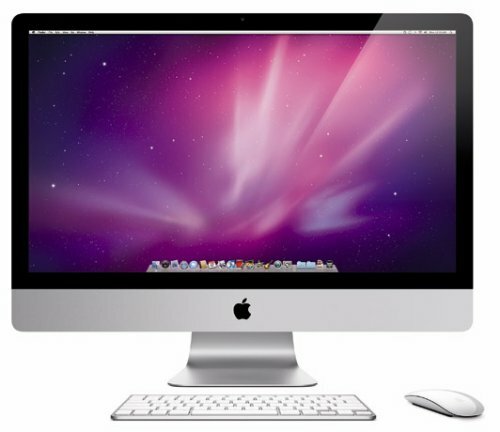 PCPerspective has reason to believe that Apple is preparing a 24″ iMac. 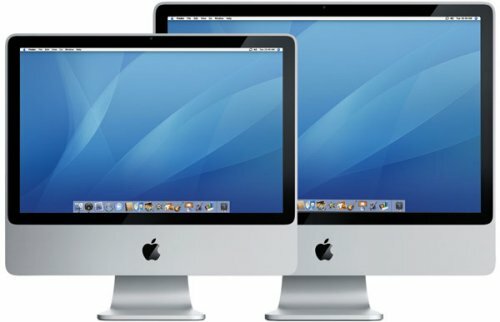 They say that we will get a set of four new iMac computers announced this week. Two 20″ iMacs with an NVIDIA integrated-GPU chipset based on the MCP79 design (the same used in the most recent MacBook and MacBook Pro notebooks) and one of those will include the mobility GeForce 9600-series discrete GPU as well. This integrated + discrete graphics solution is basically identical the setup the new 15″ MacBook Pro includes. If you buy into the hype, the 24″ iMacs will have the same integrated chipset but both of these will include discrete graphics solutions. The lower-end 24″ model will use the same mobility 9600 series that the MacBook Pro uses and the higher-end model will use a slightly faster GeForce 9800M solution. That would make the new 24″ iMac a useful gaming machine. For many the iMac is not just a computer – it is also a piece of art. To that end a company by the name of Chromac recently unveiled a line of tasteful enclosures to up that artsy look. These iColor enclosures are priced at around $500 starting. The Chromac iColors come in 11 colors and let iMac owners customize their computers with “high end finishes and materials commonly found in a Gulfstream jet or Rolls Royce.” These designer upgrade choices include chrome, 24K gold, platinum and lime green. 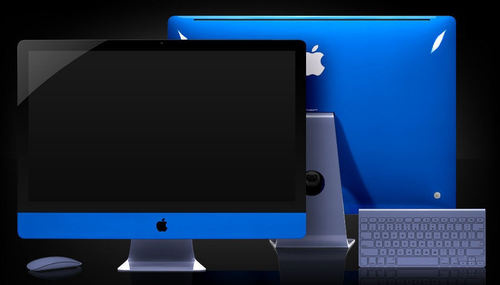 Chromac is also known for designing customized aluminum cases for iMacs as well. Today Steve Jobs announced Apple’s new iMacs at the companies summer press conference. The announcement came as no surprise to most as rumors of the new iMacs and their features have been plentiful over the past weeks. Jobs made heavy reference to the construction materials of aluminum and glass with the new iMacs, talking of its “elegant” look, the fact that the glass is scratch resistance and how both materials are recycle-friendly. 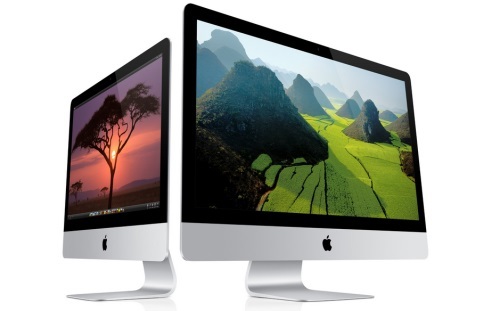 The new iMacs will come three models of 20-inch and 24-inch glossy frames. All three models feature USB 2.0, Firewire, 8x SuperDrive, and an iSight camera as you might expect. They also house aCore 2 Duo processor, ATI Radeon HD Pro graphics card, 802.11n, Bluetooth 2.0 and 1GB of RAM. 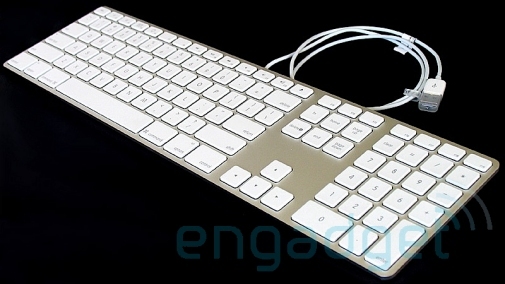 Is this a picture of a new keyboard from Apple that will come with the new iMac? The folks over at Engadget received a tip and this looks like it could be legit. It has the same brushed aluminum finish as we are expecting with the new iMac and it’s certainly as thin as we would like to see as one of the photos holds up a ruler showing the keys sticking up to just slightly over one millimeter. The rumor came from a message board where someone had a number of these supposed new iMac keyboards for sale for just over $150 each. Since then most of the pictures have been taken down. 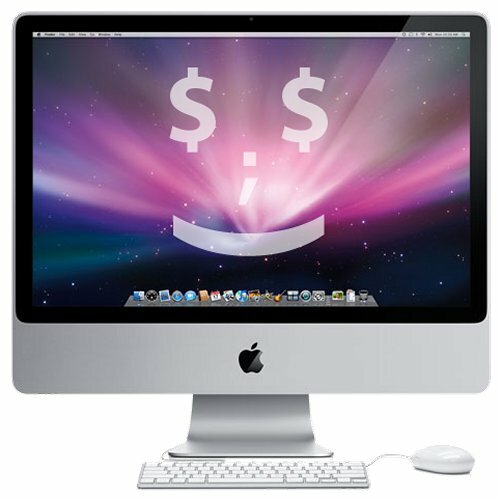 More rumors are being fuled across the blogosphere from ThinkSecret with additional information on the new iMacs from Apple. It looks like the release of these new units are on track for an August launch and will be sporting a brushed aluminum enclosure instead of the shiny white plastic. 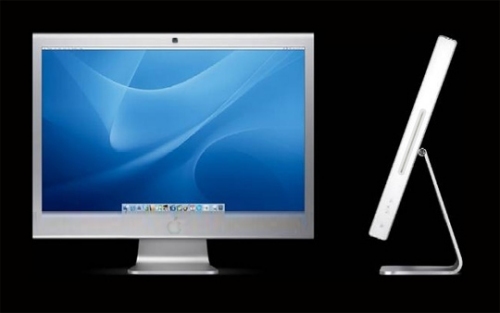 Although the frame overall will be very similar to the current iMac it will be thinned down to only 2 inches thick. The bottom space below the screen will be shorter too, giving more screen compared to overall size on the enclosure.